You hear the word "asteroid," and a flurry of doomsday scenarios come to mind. Couple that with "potentially hazardous," and you're absolutely certain that Earth is in mortal danger. 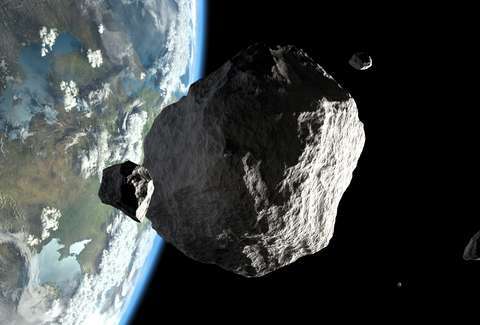 But put down that Xanax, and close all the tabs you've opened on doomsday-prepper websites: The "potentially hazardous" asteroid primed to pass by Earth tonight is nothing to worry about. So, if there's no immediate need to seek refuge in a bomb shelter, why is the asteroid hurtling by us at 20,000mph a non-issue? The asteroid, which is named 2016 NF23, was labeled a Near Earth Object (NEO) by NASA due to its proximity to Earth. But "close proximity" is a relative term: when it passes us by at at 11:38 ET tonight, it'll do so from 5 million miles outside of Earth's orbit, according to a report by Space.com. Lindley Johnson, planetary defense officer at NASA Headquarters in Washington, told the space publication: "There is absolutely nothing for concern by this pass of 2016 NF23. This object is merely designated a Potentially Hazardous Asteroid (PHA) because its orbit over time brings it within 5 million miles (8 million kilometers) of Earth's orbit, but there is nothing hazardous to Earth or even unique about this pass of the asteroid." To put the distance in starker perspective, 2016 NF23 is set to pass by Earth at 13.2 lunar distances -- or 13.2 times the distance between the Earth and moon. The asteroid garnered a fair bit of hysteria due to some of its jarring features: It's roughly between 229 feet and 524 feet in diameter, according to NASA, making it potentially bigger than the Great Pyramid of Giza. There are, at this very moment, much larger wayward rocks traveling through space that pose an incredibly tiny chance of killing you. More to the point, NEOs regularly traverse the outer reachers of Earth's orbit, and often do it at closer distances than 2016 NF23. Per Space.com: "As of Aug. 23, NASA was aware of 1,912 potentially hazardous asteroids." Does that give you 1,912 reasons to fear the impending destruction of our planet? We think not.